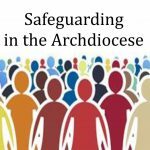 Archdiocese of Wellington – Catholic Thinking – What’s Happening in Intercession? Home » Wel-com » Catholic Thinking – What’s Happening in Intercession? Catholic Thinking – What’s Happening in Intercession? 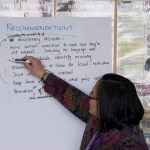 In WelCom’s Catholic Thinking series, lecturers from Good Shepherd College – Te Hēpara Pei and The Catholic Institute of New Zealand – Te Pūtahi Katorika ki Aotearoa, share their views about a range of topics on theology, mortality, ethics and faith heritage. 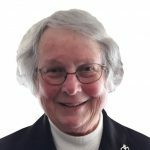 This month, Sr Elizabeth Snedden rscj discusses intercession. Intercession is defined as: the act of intervening on behalf of another or the act of praying to God on behalf of others. At his first public appearance after his election, Pope Francis took the world by surprise when he began by asking the crowd gathered in St Peter’s Square to pray for him. He took us by surprise not only because of his simple humility, but because on the whole we under-estimate the prayer of intercession and its importance in the scheme of things. The Pope does not. Intercession is prayer for or on behalf of some person or group, a community or event. It can be a simple and spontaneous blessing when we glimpse someone or their picture, a longing directed towards God for their full human flourishing and happiness. It can be our instinctive response to hearing what someone is enduring: ‘O Lord, help and protect them!’ In both instances we acknowledge the limits on our ability to help and the boundless power and kindness of God, so it embodies both self-knowledge and faith. Intercession can also be a more deliberate and sustained activity. 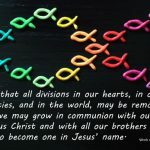 When I was living in Christchurch during the 1970s I joined an interdenominational group called Intercessors for New Zealand, who felt called to pray for our country and all its people. We prayed at home during the week but gathered early on Sunday mornings to pray together that the undecided might choose to go to church, that their pastors might be empowered by the Holy Spirit to offer Good News in their preaching and that everyone might be moved to deeper faith and stronger love in the hope of the Christian message. It was well worth getting up for at 5am even in the winter! Parents instinctively express their love for their children and grandchildren by holding them in prayer before God. Priests are bound to pray the Divine Office daily for the people in their care, for the whole Church and the world. In the Mass liturgy we offer the Prayers of the Faithful, which are in part petition for ourselves but mainly intercession for others. We recognise Carmelite Monasteries as powerhouses of prayer and know they are joined with Christ in serving – and saving – the world by their hours of prayer. We are inclined to ask others we see as close to God to pray for us. So intercession seems to be important. But why is this so? Firstly, God has asked it of us: in the Hebrew Scriptures Abraham pleads for Sodom, beating the Lord down, ‘…say if you can find only ten good men, will you spare the city?’ and God relishes this (Gen.18 22-23). Moses is the one who entreats God to save Israel. The prophet Isaiah has God instructing his people to station watchmen on the walls of Jerusalem by day and night to keep God mindful of the chosen people. In the New Covenant Jesus modelled intercession for us, praying for Peter that his faith might not fail, asking God to consecrate the apostles in the truth and praying for the forgiveness of his executioners. He also instructed us to ask, seek, knock and to persevere in these activities. And as the Risen Lord, Jesus constantly intercedes for us at the right hand of his Father in heaven (Rom.8.34). Secondly, intercession is good for us. It shows implicit trust in God’s wisdom, power and goodness, and because it springs from love for others and our poor, battered world, it places us immediately on God’s wavelength. Intercession draws us out of ourselves, transforming self-absorption into attentive care for others and isolation into belonging. We are drawn into cooperation with God’s saving plan for the world God so loves. As the Spirit leads us in this prayer we come to share God’s view of the world. Jesus even asks us to pray for our enemies as a way of doing good to those who hate us and use us despitefully. He knows that will cause love for them to grow and forgiveness to become a reality in us. Such prayer changes us for the better. Thirdly, God has chosen to associate us with the divine plan and activity for the salvation of the world. Our prayers are not changing God’s mind; they are ‘according to the mind of God’ and contribute to the ongoing mediation of Christ for the life of the world. Pascal claims that God calls us to intercede for others ‘to give to humanity the dignity of agency’. As the Church is shaken by the revelation of the terrible sins of abuse and neglect of the needs of victims, the Pope is calling the guilty to penance and all of us to prayer for reform and renewal worldwide. Elizabeth Snedden rscj lectures at Good Shepherd College – Te Hēpara Pei, on Spirituality and Ecclesiastical Latin.